Warm weather and clear skies greeted a full roster of 350 runners at the Tahoe Rim Trail 50k/50 mile (and RRCA Trail Championships) last week in Spooner Lake, NV. A late snow season guaranteed a little bit of everything at this race – snow field crossings, lush wildflower valleys, 360 degree views of Lake Tahoe from a 9200 vertical foot peak, and the brutally humid Red House loop. Despite these challenges, course records were destined to fall. 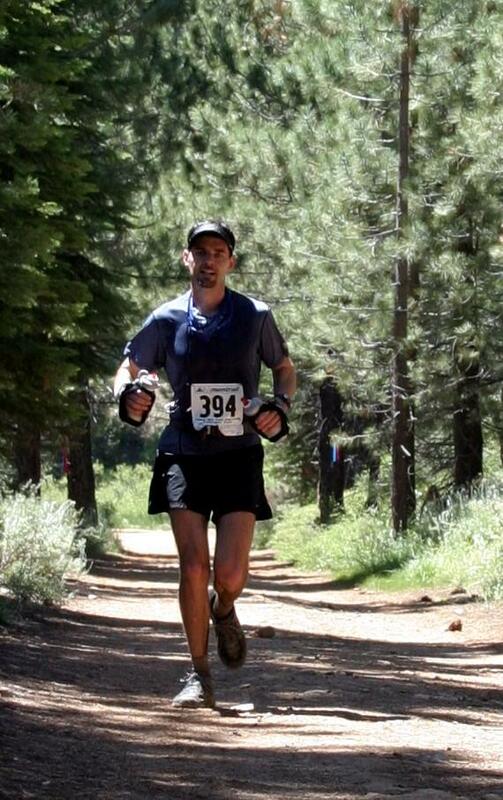 The Tahoe Rim Trail (TRT) 50k/50 mile is one of just a few races along the 150-mile Tahoe Rim Trail that circles Lake Tahoe Basin. The TRT is exquisitely maintained, alternating between rugged climbs, dog-friendly valley paths, and the famous Flume Trail cut into the side of the cliff (also home of the Xterra Off-road Triathlon National Championships). With an elevation of 6400-9200’, the thin mountain air provides an additional challenge. On Saturday, Christi and Rocky dropped me off at o-dark-thirty to prepare for the 6am mass start (mumbling something about how Starbucks doesn’t even open for another hour), and I found my way to the bright lights of the tents. Everyone was in good spirits, with many runners returning to make good from last year’s canceled race due to forest fire. Many of those return runners were from out-of-state (Connecticut, Wisconsin, etc. ), and happy to return to the beauty of Lake Tahoe. I consider myself a rookie at the 50k distance, so I was happy to chat with the more experienced runners and get some tips (some good ones included “ask for ice in your water bottles” and “if you’re wearing an iPod, watch for mountain bikers”). Sunlight began to break at 6am as both the 50k and 50 mile runners headed down the road-sized trail. Paul Youth and Dan Stoll-Hayadia quickly pulled off the front, with a pack of 4-6 runners not too far behind them. I ran with Aaron Summerhays from Carmichael, CA, a natural athlete who does a few ultras/marathons each year, and Chris Luberecki from Tahoe City, CA, a multiple top 5 finisher in this race. Together, we made our way to the first aid station and refueled. Few things can bring a smile to my face as fast as a well-stocked, well-run aid station, and at the TRT 50/50 I was grinning ear-to-ear. At each stop, we were in and out with Indy pit stop precision, including a spritz and sponge-down if needed. Fruit, nuts, Oreos, Sharkies, gels, and PB&J were all fresh and ready to roll. I made good use of the first aid station (how can you turn down Oreos? ), and stopped for a minute to pull a handkerchief over my neck as the sun came over the hills. From there we climbed up Marlett Peak, crossing a few remaining snow fields hiding in the shadows, and working our way around a few early-start 50-milers posed for pictures. Randy Wilcox from Reno, NV caught up with us and set a blazing pace over the next 4 mile downhill section to the top of Red House (Mile 11). His tunes were cranked, and he definitely had a rhythm. I stocked my bottles with ice and chased Randy down the steep Red House loop. The temperature and humidity changed drastically as we headed down Red House on the “Reno side” of the mountains. The air became stagnant and moist, and my watch was reading 92 degrees. Luckily there was plenty of shade (and another small aid station), and a few stream crossings to keep the toes cool. Randy took a digger in one of the streams – I guess that’s one way to keep cool. ;oP As we wound our way back up, Randy reminded me that “Red House” is only the beginning since we had to climb back up that 4-mile set of switchbacks as well. As we huffed/puffed/sweated our way to the top of Red House, the cheery faces of the 50-milers were on their way down. I saw many familiar faces who had helped me in previous races – Marty Hoffman had a great pace going, Troy Limb wasn’t too far behind, and the infamous Gordy Ainsleigh (founder of the Western States 100) came a mile behind them, toting a gallon jug of water. We slapped high fives and cheered them on before refueling one more time at the top of Red House (mile 17). As I put on my iPod headphones and ate as many M&M’s as I could, a wave of locals (Steve Roark, John Ostezan, and Auburn’s Julie Young) cruised right by. They were just getting warmed up. For the next five miles, I rarely saw a soul. The climb was tough, as Randy had warned, but not enough to get my eyes off of the gorgeous deep blue of Lake Tahoe. Every three of four turns, she would peek her blue eyes through the trees and give you your bearings. The new Foo Fighters album kept my pace up, but within a few miles I was walking the uphills to keep my heart rate down. I also noticed I was consuming far more water than I had guessed (about one bottle every 20 minutes), which meant I was going to run out before the next aid station. No worries…just keep moving forward. At mile 22, I got another great Indy pit stop, but let them know I had gone without water for a while and was feeling dizzy from the heat. They sponged me down and fed me some watermelon, and let me sit for a minute. But they said go for it, and pointed me to the last 1000’ vertical to 26 mile aid station at the top of Snow Peak (9200’). I cranked up some White Stripes (Wild Orchid) and hit the trail. As I worked my way up to the Snow Peak, I caught myself pouring some of the ice cold water on my head and suddenly understood why my water was depleting so quickly (can you say “rookie move”?). Luckily the local Boy Scout troop had hoisted a small warehouse worth of water and food to Snow Peak, so there was plenty to restock before plunging down the last 5 miles. My pace had slowed to about 9:30 miles, which was enough for 2-3 more people to pass me up before doing the final lap at Spooner Lake. Christi had returned to snap some photos (see above! ), and escorted me up to the volunteer masseuses who worked their magic on my twitching calves. I ended up 14th in just over 6 hours, well off the course record pace set by the screaming-fast Paul South and Dan Stoll-Hadayia (4:37 and 4:39, respectively). Julie Young of Auburn, CA, had held on for 1st female in a respectable 5:32 (second fastest ever by a woman), and Bryan Hacker of Cool, CA, and Kitty Marcroft of Halley, ID, picked up the Masters Awards. Jeff Kozak of Bishop, CA, won the 50-mile with Michael Uhler of San Leandro, CA, just 9 minutes behind for the Masters Award and 2nd overall. Local Jenny Capel of Reno, NV, finished first female (shaving 28 minutes off the female course record) with Kelly Ridgeway of Santa Rosa, CA, winning the Masters. Everyone who finished got a great duffle bag and finisher plaque, with a few extra goodies for the new RRCA National Champions. My thanks to David Cotter, Kevin Bigley, the Tahoe Mountain Milers, the Sagebrush Stompers, and all the volunteers who made this such a great race. Congrats to all who finished, particularly the new RRCA National Champions. The race lived up to the tag line – “A Glimpse of Heaven and a Taste of Hell” – and I would highly recommend it. Thanks for this awesome blog. I ran across it last week, and have read almost every post :)You've definately inspired me to go out and hit some local trails this weekend! Anyway, our site isn't dedicated to trail running, it's about a group of us that are training for our first triathlon and raising money for charity. I hope you will stop by and say hello! Sounds like you're ready for the 50 miler...assuming you stop pouring your water on your head. Thanks for the questions, Emma. My family has a place in Tahoe, so I crashed there. I have heard that camping at Spooner or Marlett are both great. The closest town is Incline Village, which has a number of hotels and rental cottages (just search online) - most prefer renting a cabin or cottage over the hotels. Frederick's - Innovative asian/californian food (including sushi) and great wine at this bistro. You can often sit at the bar without reservations. Le Bistro - Fresh french fare in 4-5 course fix prix menus. This is a good date place, quieter than Frederick's. Great Alaskan Fish Co - Great seafood (try the Thai soup!) and this casual dining spot. We hit this spot every time we come up. Bring the kids. Lone Eagle Grill Bar - Although I'm not a fan of the restaurant, the Lone Eagle Grill Bar has a killer view, and good cocktails and appies. It's worth a stop. Mofo's Pizza - Where you get "mo fo yo money". Family friendly. TJ's BBQ - Good rotisserie and burritos, and it's totally okay to stop in right off the trail. This one is a local fav. Great race reports! I'm very new to running, but already have had a few thoughts of running a 50k (that's after my 1st marathon in December). I'll be running the 1/2 marathon at Lake Tahoe in October. I'm a little nervous in regards to the altitude. Any suggestions? I live in the SF Bay Area at about 10 ft above sea level! Regarding altitude, the best thing to do is get up there and try a few test runs at the altitude you're hoping to race. You'll get an idea of how much it's going to slow you down. It's different for everyone - some feel like they are going to blow chunks at 5k vertical, whereas others can cruise the whole Leadville 100 above 10k without any trouble at all (well, I mean any trouble beyond your normal 100 miler). One important thing not to forget is to be as hydrated as possible - I've found I can drink 40-45 oz of water per hour at Tahoe, but can barely keep in 28 oz/hour in SF. Carry extra sunblock too.